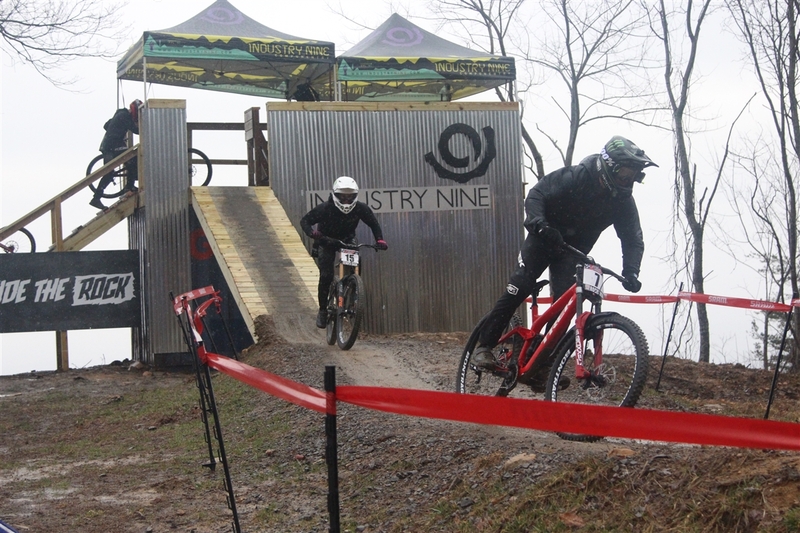 Welcome to Windrock Bike Park in Oliver Springs, Tennessee. Charlie Harrison Leads Nik Nestoroff out of the start hut for the 1st national race of the year. 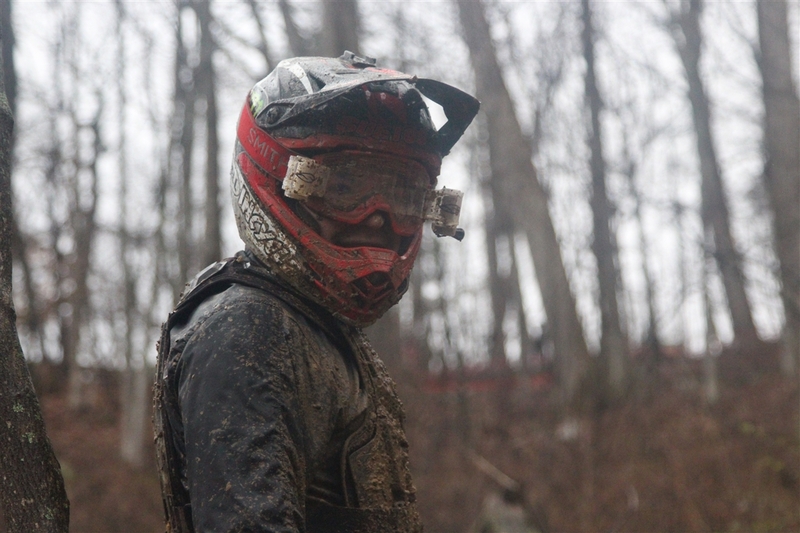 Day 1 of practice was quite foggy, but the worse weather was yet to come. 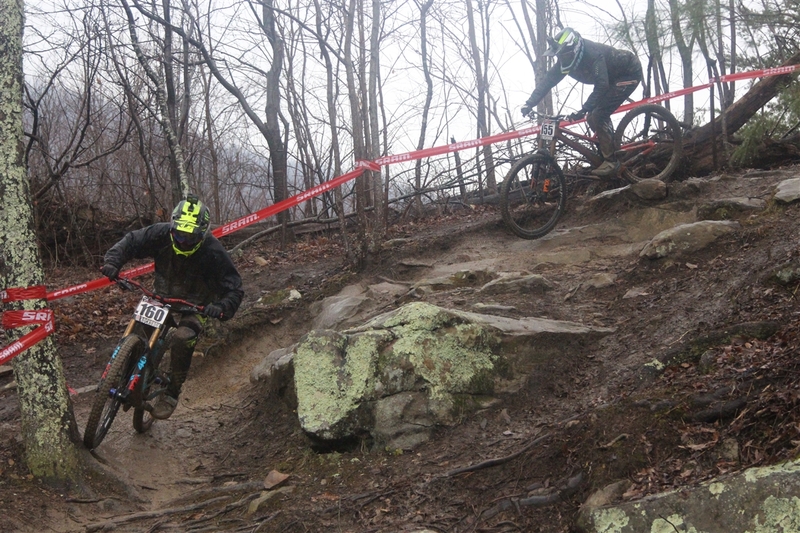 Matt Sterling takes a familiar line in the 2nd corner of the course with Austin Dooley in tow. 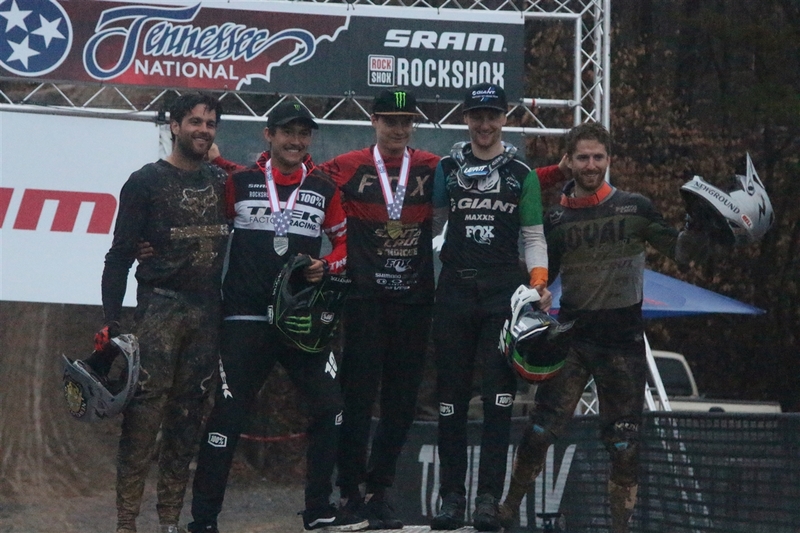 They’re both on new bikes this year with Matt switching to a Pivot Phoenix and Austin to an Intense M29. 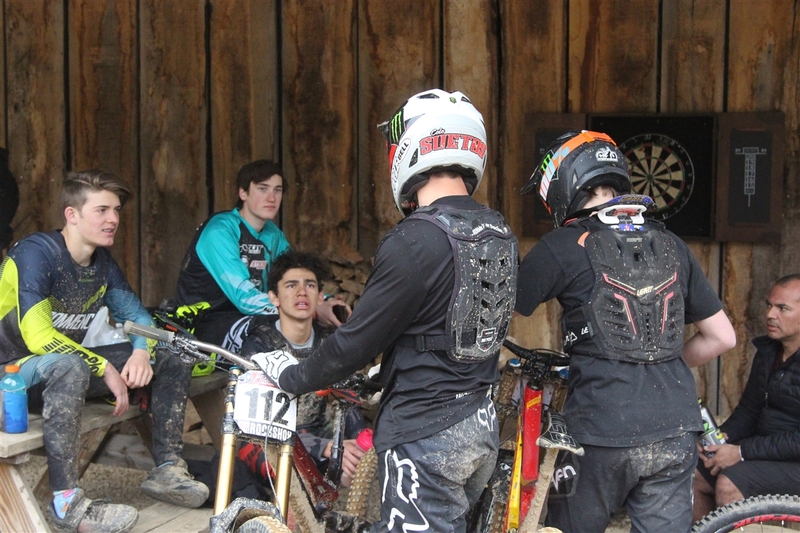 Cole Suetos and Zach Gareis share their findings with their teammates, Kaden Pankow, Matt Sterling, & Dante Silva. 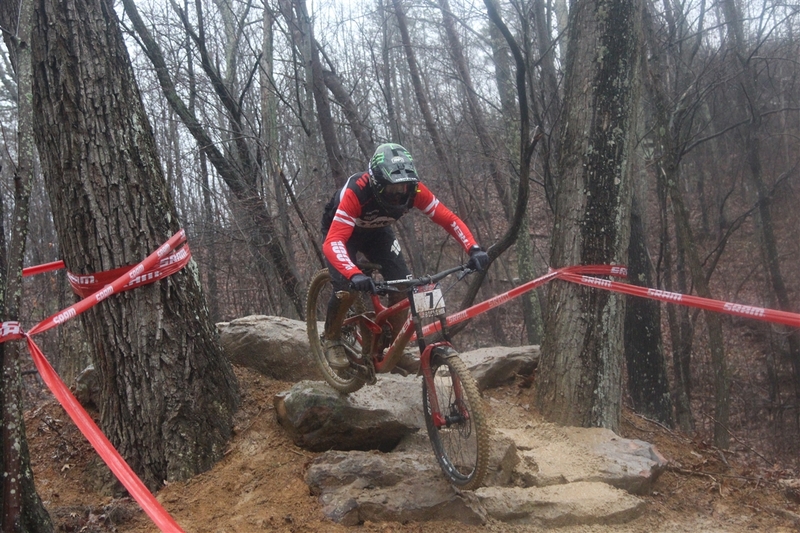 Nik Nestoroff figures out the rock garden early on whilst aboard a KHS 29er prototype bike. 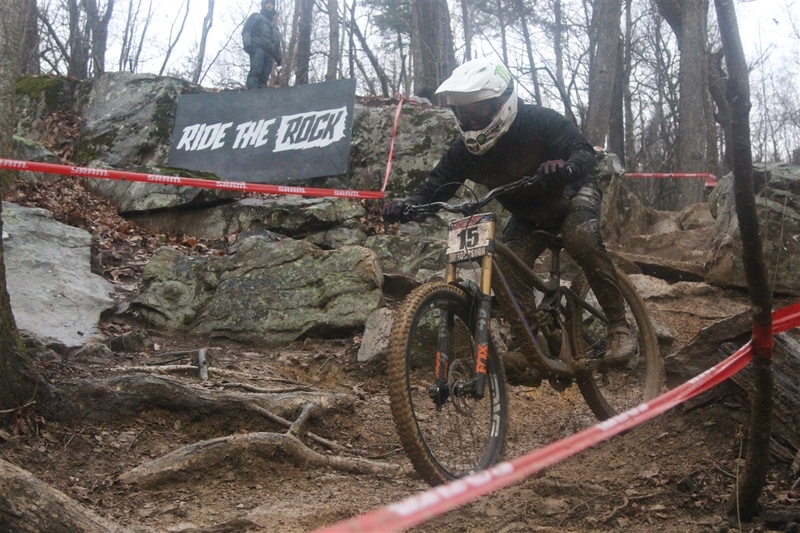 Californian Junior, Ethan Alexander made his first trip out to Windrock to enjoy playing in the mud. 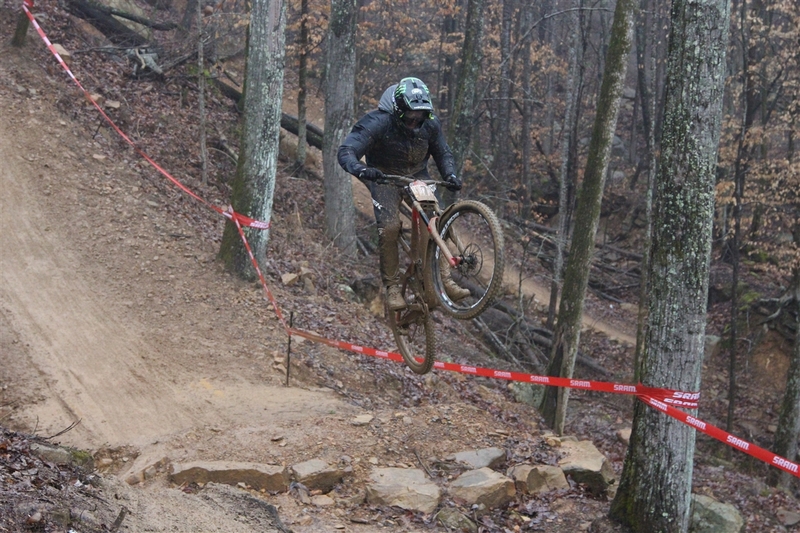 Windrock Bike Park is part of the Windrock Park, the biggest OHV park in the country at 75,000 acres. 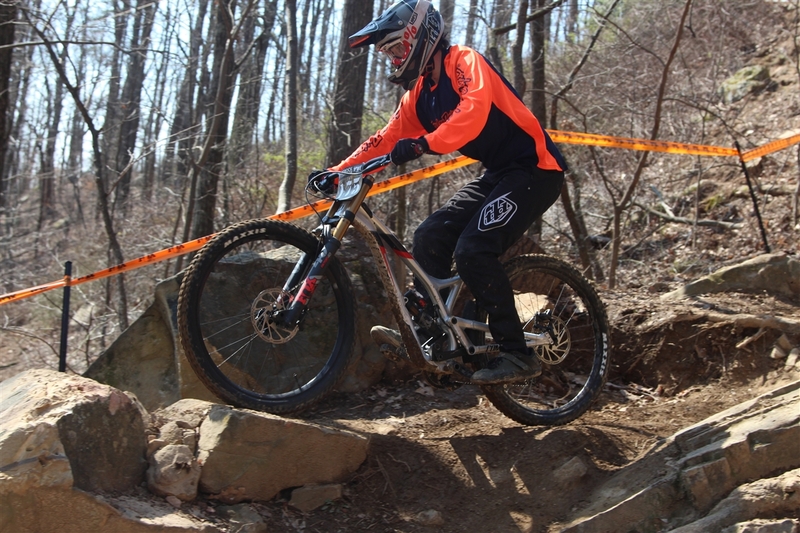 The bike park has become the hub in the southeast for downhill riding, with legend Neko Mulally running the park and teaching the juniors. 2018 USA National Junior Champ, Zach Gareis kicks off qualifying with a 4th place against some of the best Junior Experts in the world. 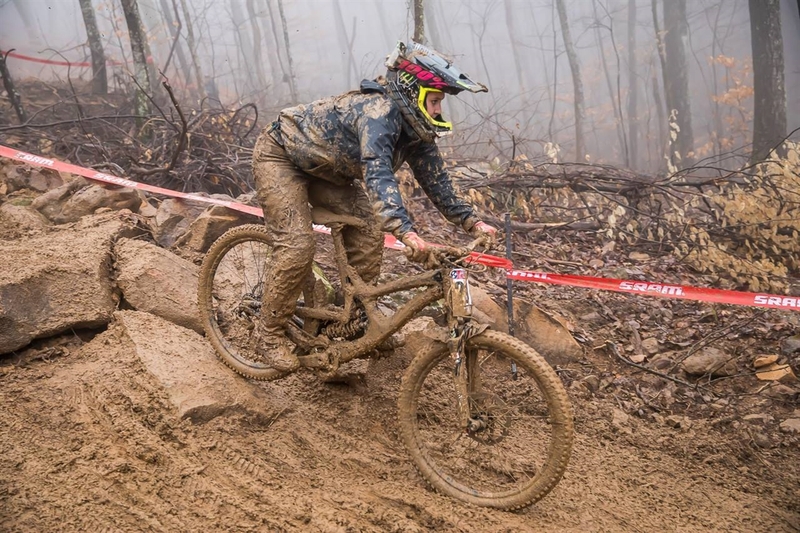 SoCal’s Angelo Loskota would race in the domestic pro category for his first year out of Juniors. He would finish 6th on race day. 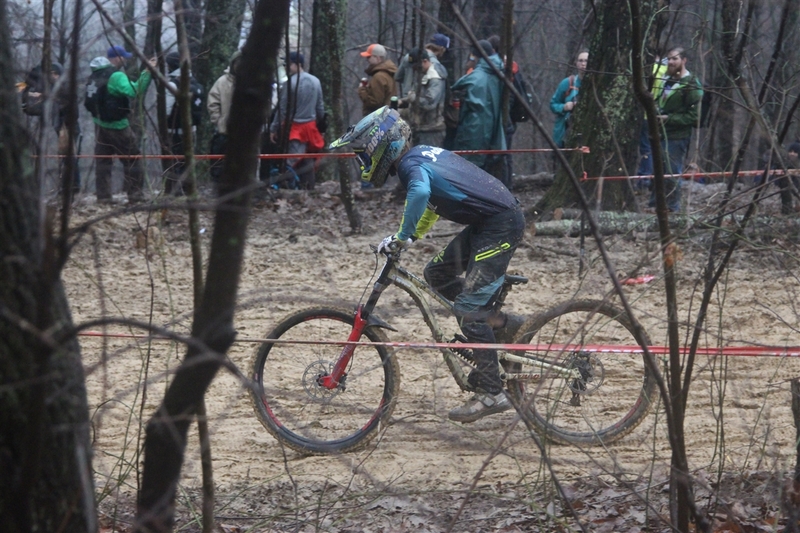 After Qualifying 1st in the Elite Men Category, Charlie Harrison was the man to beat on Sunday. Charlie sends the big boy step up near the bottom of the track during the 1 hour practice. Cole Suetos demonstrates how to become one with the track. Not your typical California conditions, but a little studying during practice and Cole would improve from his qualifying position. 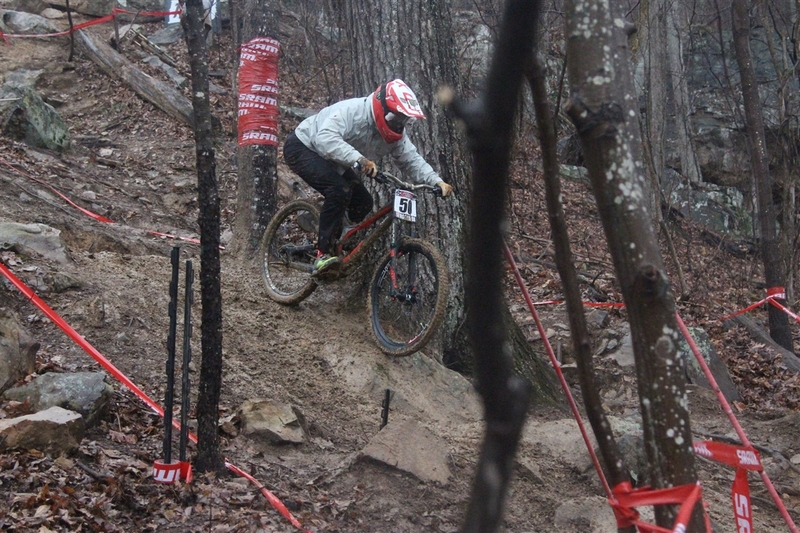 Emily Harris would throw her goggles back and rally down the mudfest of a course to take the win in her category. 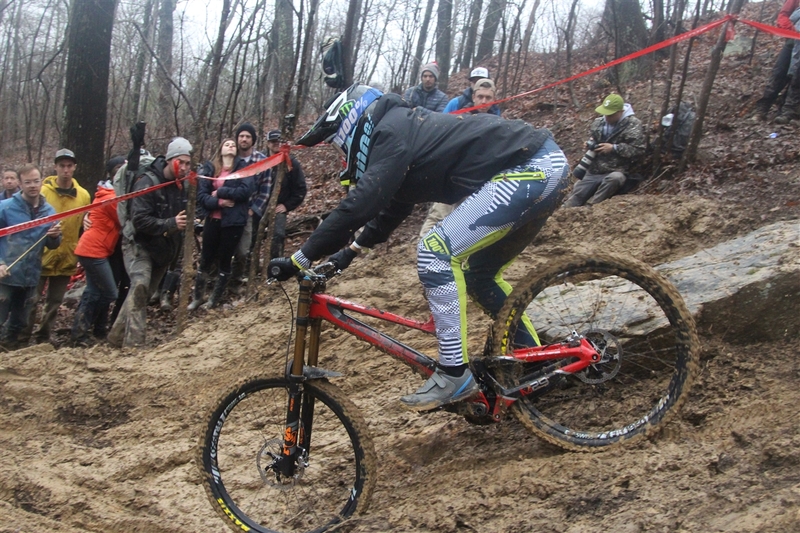 Austin Dooley drops in on the first really muddy section, and the first section with real fans. He would finish 11th on the day. Dante Silva cleans the rock garden looking good enough for 10th. 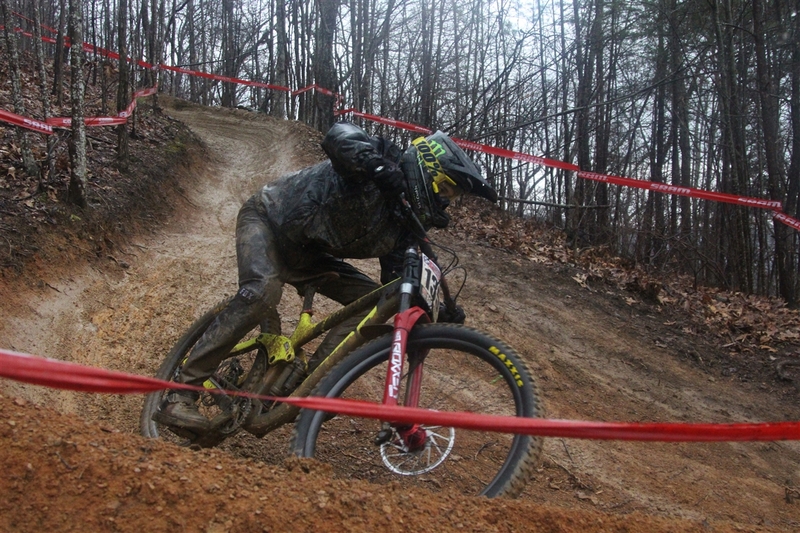 Kaden Pankow pedals through the slop aboard his Commencal 29er. He would end up crashing and having trouble clipping back into his pedals. 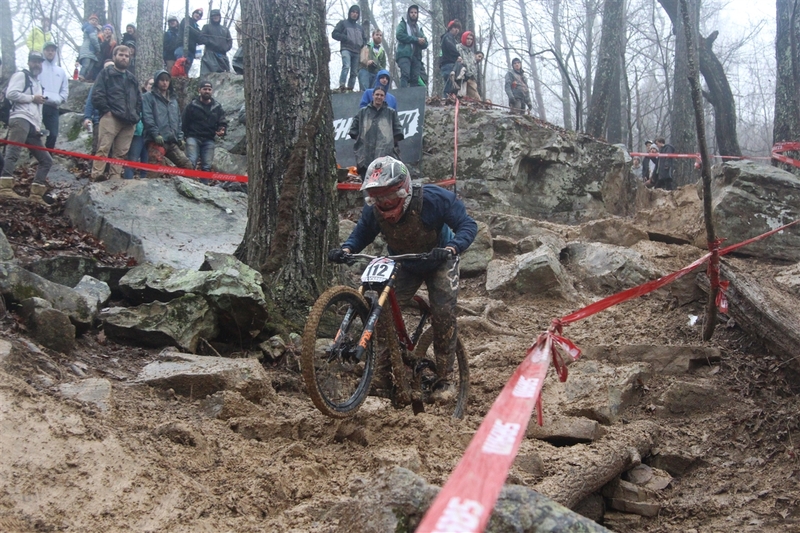 Cole Suetos ran it smooth in the flying mud to a 5th place finish in the JR EX category. 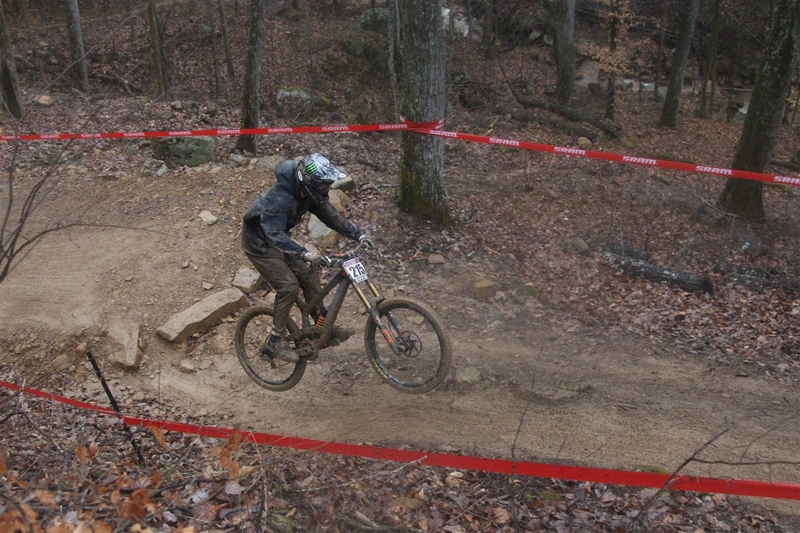 Matt Sterling slings it wide at the bottom of the rock garden en route to a solid 4th place finish. Titus Nicholson enjoyed his first race in the pro category rallying through the slop. 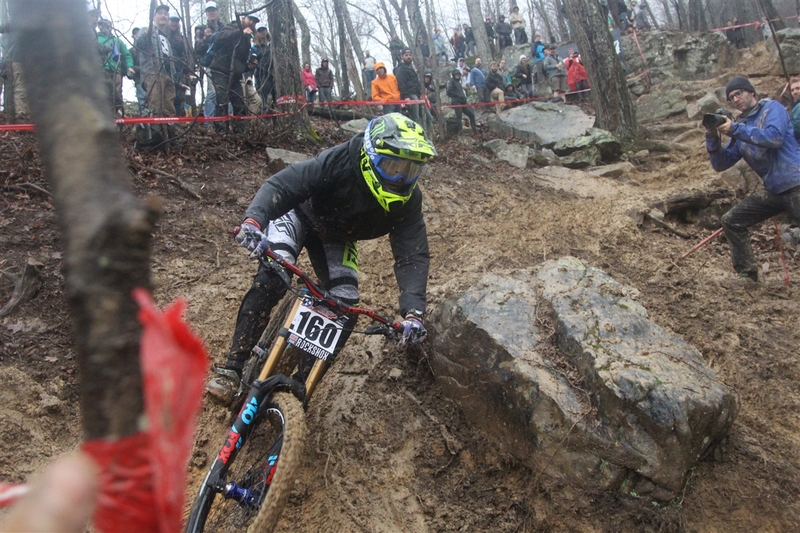 Nik Nestoroff had a strong 1st showing of the year showing with a 9th place, only 1 second off of 5th. 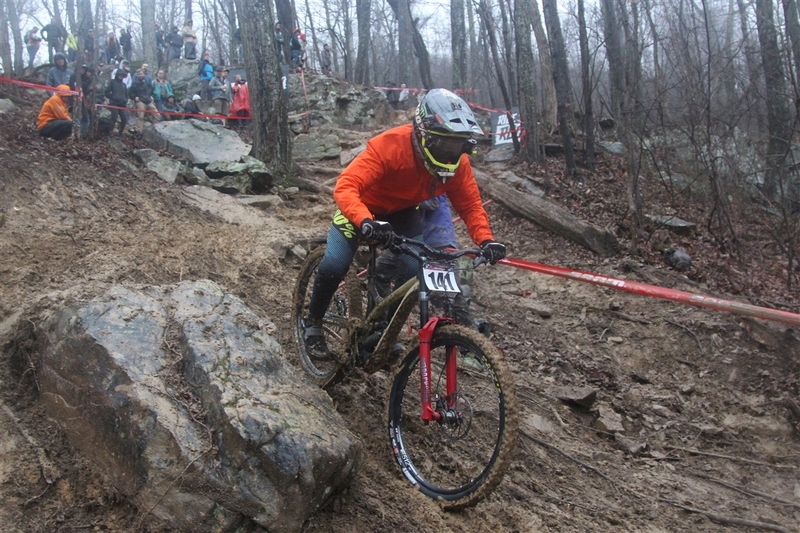 Charlie Harrison was on another level all weekend having familiarized himself with Windrock at the Downhill Southeast races years ago. 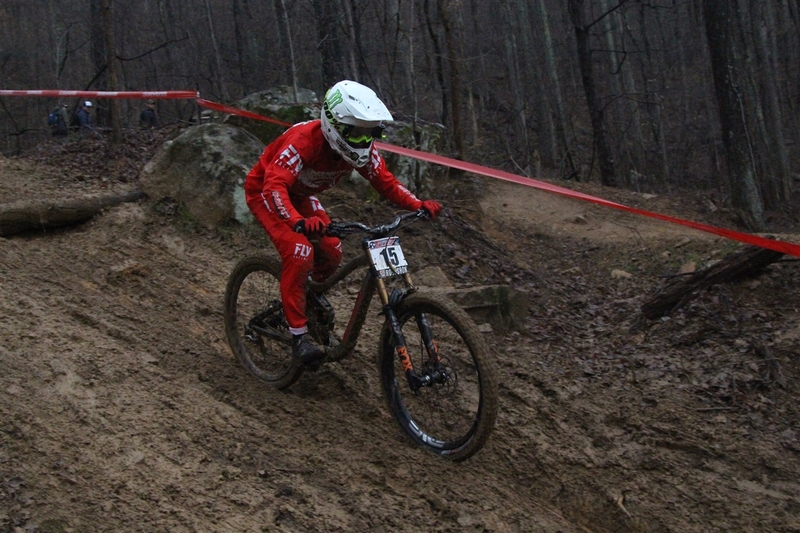 He would best 3rd place by 5 seconds, but miss out on the win by just half a second to the Frenchman, Loris Vergier. Matthew Sterling went 4th to be the fastest USA Junior, only 1 second off of third. 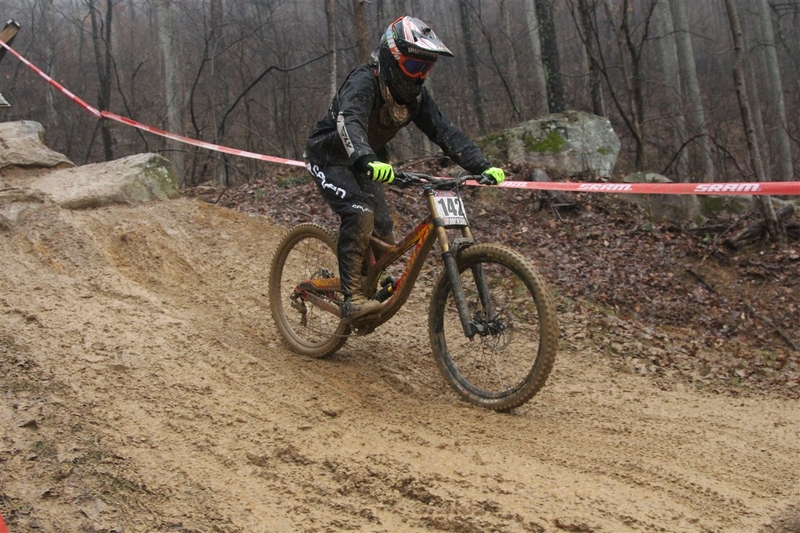 Cole Suetos would snag himself a 5th place finish, 4 seconds behind Matt. 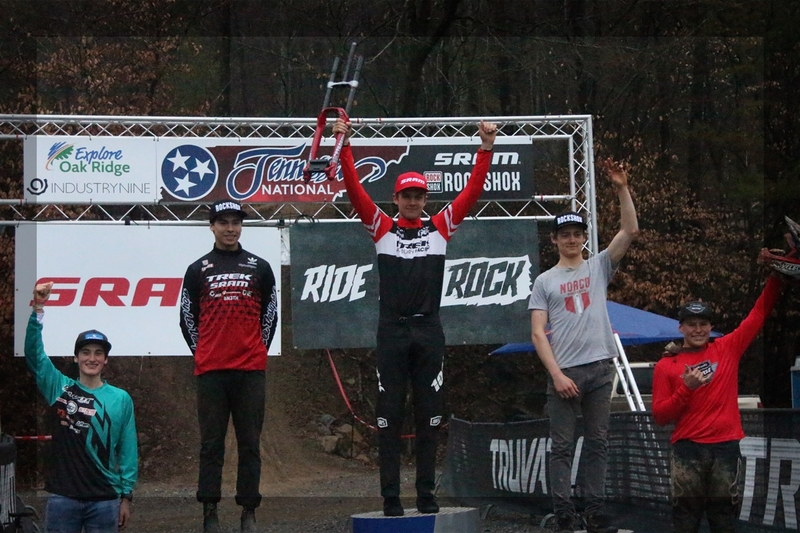 The Elite men’s podium, featuring Charlie Harrison in 2nd place. 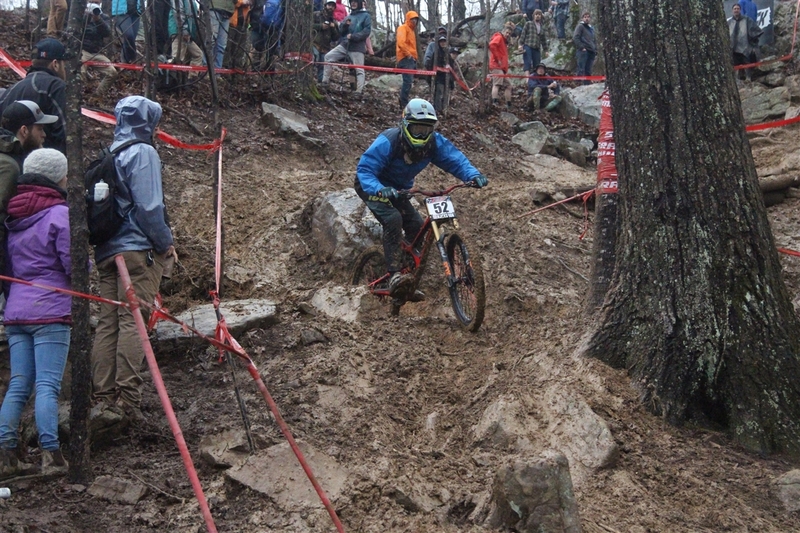 The clouds had just darkened and moments after podium it began to pour down yet again. 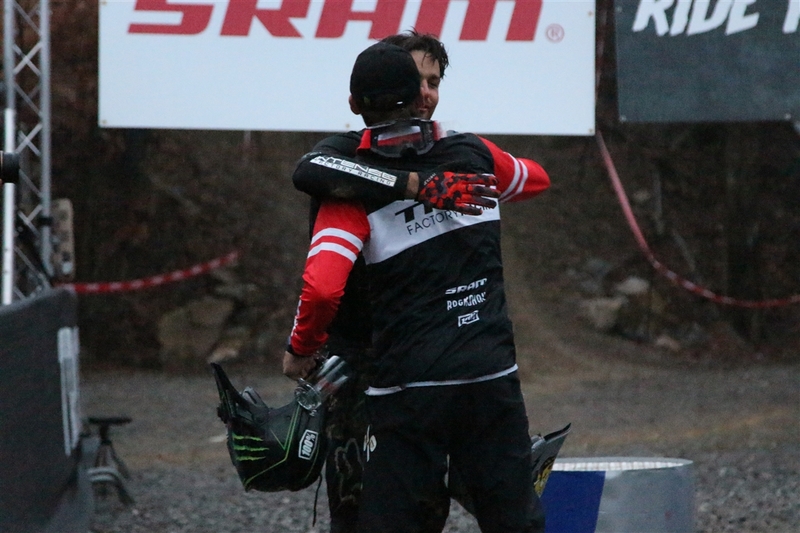 Charlie and Neko share a hug after a successful weekend for both of them. 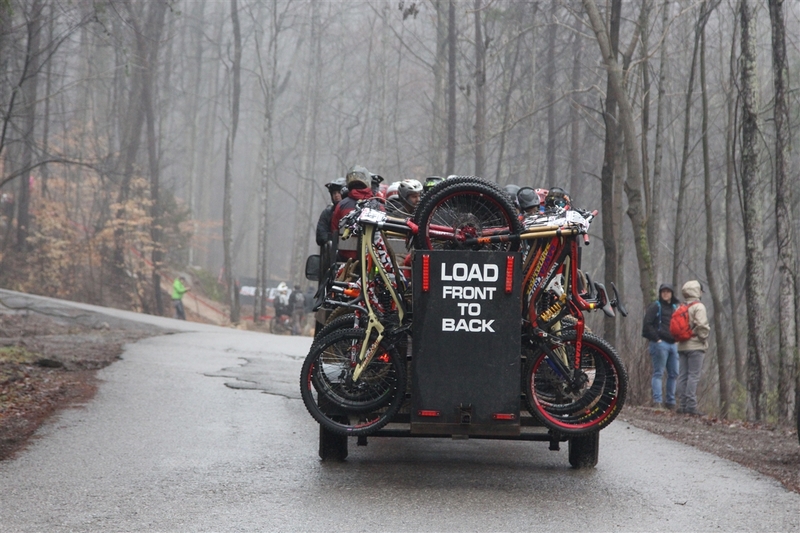 We’re off for a month and then back for the 2nd national round up in Port Angeles, Washington!